With over 420 Open Table guest reviews, we are proud to garner over 4.3 our of 5 stars for our food, service and ambiance. 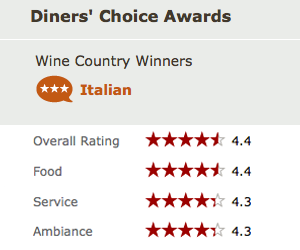 And we are a “Diners’ Choice Award” winner for Wine Country Dining. Since 2002, Bistro Don Giovanni has consistently been included in Michael Bauer’s Top 100 Bay Area Restaurants.